Disruption requires discomfort, which is why many thought the hospitality industry was immune to such changes. Who wants to be uncomfortable while traveling? Yet AirBnB was able to disrupt this massive industry in a way no one thought possible. And all of that is beside the point. Most case studies present an idealised version of the business development process. They do not capture, or even allude to, the stress of the situation. More often than not, things go according to plan and when there are problems people very calmly solve it in a board room with a white board. The participants use all the right terms and everything fits neatly in a given paradigm; helpfully the one that the case study is meant to explore. The problem is that perspective does not apply to AirBnB, and this case study won’t try to portray it otherwise. It is true that some of the things AirBnB did followed elements of Lean Startup, the process which us relies on to work with its partners. But much of what AirBnB has done, especially in the early days, was reactive – not proactive. This means instead of trying to anticipate and build structures that would sidestep problems, AirBnB would often encounter situations (which often threatened its long-term prospects) and have to scramble to find a solution. Which leads to the most important identity you can have as an entrepreneur: problem-solver. At the end of the day the only thing that matters is that when a problem comes up that you can solve. Lean Startup is a great method for solving problems, but it won’t always necessarily apply. A lot of the best fixes AirBnB accomplished, heck the very idea itself, was not a function of the Lean Startup method. Do not become dogmatic in your approach to addressing situations as an entrepreneur, and you will increase your opportunities for success. So how did AirBnB get to where they are today? It began with desperation. Depending on who you ask, the first step of any marketplace business is to figure out the demand side and the supply side of your business. Figure out who you are going to sell to or what you are going to sell, then validate to make sure you are doing the right thing. The problem is that both of these are wrong; neither is the first step. The first step is desperation. You have to be desperate to take a risk and do things no one else is willing to do. If you aren’t desperate, for whatever reason, you will just settle into the status quo. In 2007, two unemployed art students named Joe Gebbia and Brian Chesky had taken that crucial first step of entrepreneurship and had reached peak desperation (here’s a great article on how founders met). Gebbia and Chesky were living in Silicon Valley, one of the most expensive cities in the world, and their rent was due. They weren’t looking to start a business that would one day become a billion dollar enterprise; they just didn’t want to lose their place. While scrounging for funds, Gebbia had an idea. If San Francisco was expensive for them, it was probably expensive for others, including travellers. 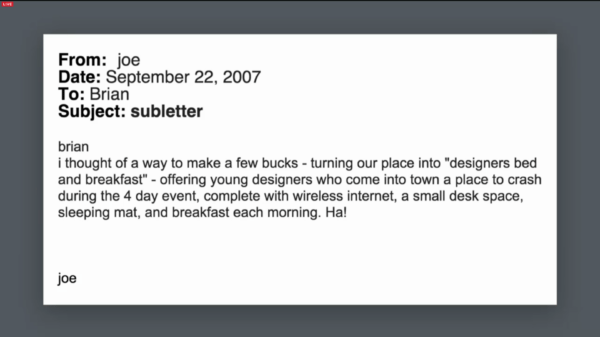 Joe noticed that there was going to be a design conference in the city (IDSA’s International Design Conference 2007) and figured that people would be struggling to find reasonably priced accommodations in expensive San Francisco. Gebbia and Chesky had extra space in their apartment and needed extra money. There was a potential deal to be made. Gebbia and Chesky knew that there were some barriers to getting people to try their service, namely that people would be hesitant to stay with strangers (this is the assumption that has to be verified). So they addressed that challenge by putting up a relatively nice webpage advertising their service. After all, in a wired world a website is one of the best signals of serious intent. As you see above, it is important to note what this website was not – fancy and intricate. The website was very clean and professionally done, but it did not have a lot of bells and whistles. Fancy features regarding scheduling, calendars or location selection were unnecessary, so Gebbia and Chesky did not bother to add them. Instead they focused on one problem; convincing people to trust enough to stay at a stranger’s house. Check this post out: Guide to Minimum Viable Product: Make Something Out of Nothing if you’re looking for some advices on how to design your first version. And it worked. 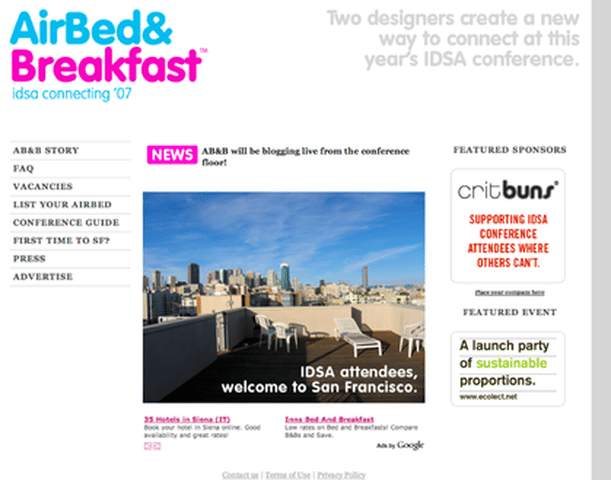 Gebbia and Chesky advertised their service in several design publications that would be read by individuals attending the conference and presented a simple, but valuable proposition. They began to advertise themselves as Air Bed&Breakfast, soon to be AirBnB. Lodgers would get air mattresses in the living room, free wifi, free breakfast, and the promise of a unique networking experience with like-minded people. 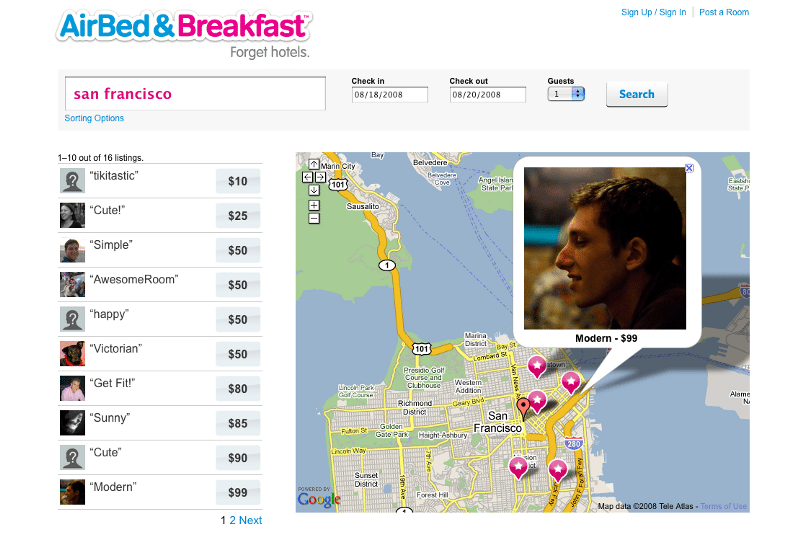 All for a lower price than lodgers would find in a traditional hotel in San Francisco. 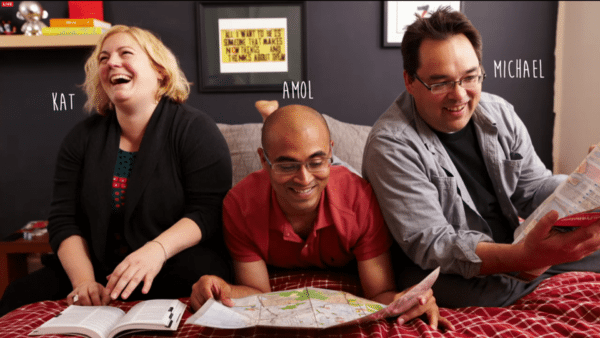 Their first three guests were Kay, a thirty-something designer based in Boston; Michael, a father of five in his forties from Utah; and Amol, a native of Mumbai who had recently graduated from Arizona State (here’s a post where Amol is telling his story). The stay went without a hitch, and Gebbia and Chesky discovered that they had something more than just a way to make rent. They verified that people would consider staying in a stranger’s house or apartment given the right prompting. Without intending to do so, they had verified that their customer base existed and that they would buy their product. 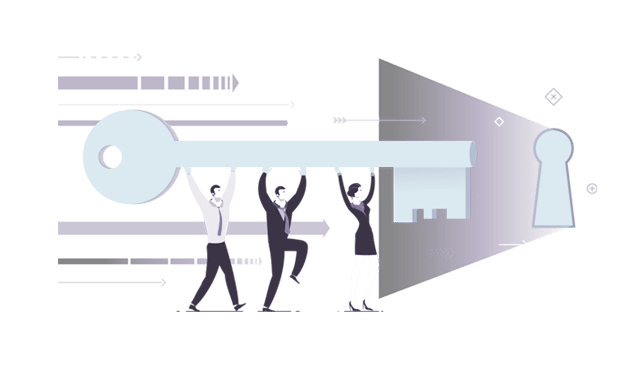 This knowledge would mitigate the risk of taking further action because they could not point to verifiable data supporting their underlying assumption for their value proposition. As Gebbia and Chesky did, make sure you are launching the first version of your marketplace platform in relation with your first assumptions. Here’s some insights on how you can approach problems or check this post to learn more about the principles you need to follow to design and iterate your marketplace. But knowing you have a customer is only half the battle. They still needed to secure their suppliers. AirBnB still needed people who were willing to host people in their residences. Let’s see how they did it. The entire world could be prepared to stay with a stranger when they travel, but if no one is willing to share their place it won’t matter. AirBnB made their foray into finding hosts in August 2008 during the Democratic National Convention in Denver. Estimates suggested that 80,000 people were expected to attend, but there were not enough hotel rooms to meet demand. AirBnB thought this would be the perfect opportunity to further test their platform, given that attendees might be getting desperate. Two weeks prior to the convention, AirBnB updated their website to include a map function so that lodgers could see where their potential rooms would in relation to the sites and locations they would want to visit. It is important to note that even at this point, AirBnB was not trying to optimise for every use case. Their focus was still on finding hosts in and around high-profile events. This allowed AirBnB to narrow their focus while maximising their return on investment by achieving a higher conversion rate quickly. While the map was very helpful to lodgers, the amount of effort to create that feature was relatively minimal, allowing AirBnB to maximise user value while minimising the amount of work that goes into it. The results were obvious. Because of AirBnB’s need to prove their model and their focus on event based stays, between August and December 2008 they had great success. They were able to generate a couple thousand of listings in 576 cities in 67 countries. But once the Democratic National Convention was over, AirBnB’s revenue cratered since their model was based on taking a 6 to 12 percent for each rental. Without the convention or a comparable event, no one was using AirBnB’s service. After several months, Gebbia and Chesky were back where they started…struggling to make rent, earning only $200 a week. 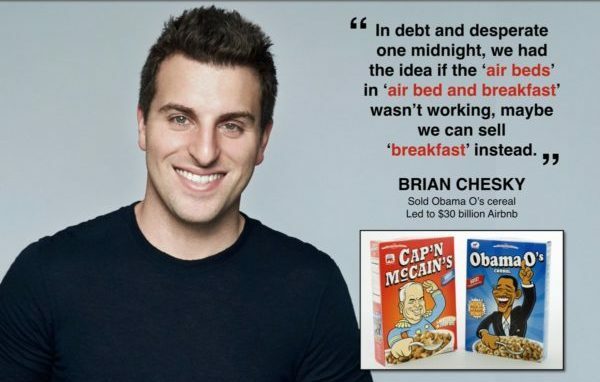 The cereal was original created as a novelty give away for the Democratic Convention, but in the end it provided a bridge of liquidity with AirBnB figured out their next move. But once the election was over, the sale of those cereal as a feasible lifeline also ended. The challenge was clear. AirBnB had verified their underlying business hypothesis, but they did not have the liquidity or guidance to stabilise the business and ensure consistent money flow. At this point they made a crucial decision and applied for Y Combinator, the most popular incubator in Silicon Valley, in 2009. The founder of Y Combinator Paul Graham, gave them crucial capital and even more important advice; travel to New York and figure out how to improve your model there. Here’s a video where Brian shares what they learned from Paul Graham. New York City was already one of AirBnB’s most popular destinations in terms of registering stays and it was easy to see why. There was always something to do in NYC and people had plenty of reason to travel there. However inexpensive travel options were few and far between. These conditions allowed the AirBnB team to safely assume that demand for their service would be high and that they could now begin to experiment with ways to improve the customer experience and increase rentals. It is important to note the shift in development at this point. Before Y Combinator, the AirBnB team was worried about generating revenue, of course, because they needed it to survive. But instead of focusing on optimizing this stream of income they just wanted to verify that the underlying assumptions of their model were correct. Their acceptance into Y Combinator was a social signal that they did have enough proof that their model would work. They no longer needed to put time into proving their model. It was now time to optimize their product and learn how to get the most out of their efforts. So the trip to NYC marked a new chapter for AirBnB. It was time to stop building low-fidelity MVPs and to start building high-fidelity MVPs. It was time to begin optimising their flows of customers and renters to maximise their revenue. 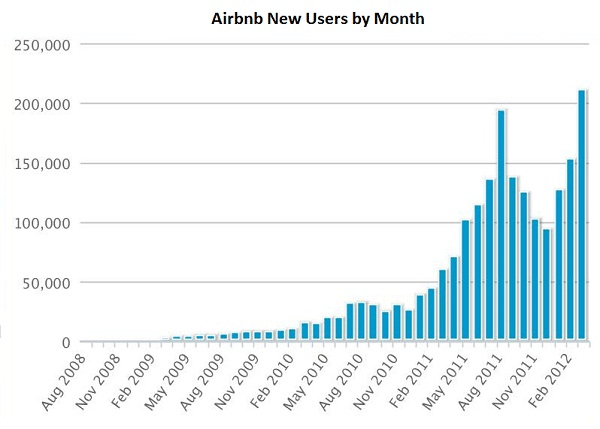 And as you can see from the chart below, this trip to NYC marked the beginning of AirBnB’s significant growth. You might not be able to judge a book by its cover, but you can sure judge an accommodation by its pictures. That is one of the first things that the AirBnB team learned when they went to New York and began talking with hosts. By browsing the archive of the web, we found an old version of the AirBnB website (March 2009) and the filter “Has photos” below suggests that a reasonably number of hosts weren’t publishing photos at all. So AirBnB was already suspected that lodgings with better pictures were more popular among lodgers, but they did not have an idea on how to address this disparity. It was in AirBnB’s interest to increase the number of stays at every listed residence since they generated their revenue by receiving a percentage from every stay. Instead of looking for the perfect solution, something that would easily scale, the AirBnB team decided to get experience by doing something that isn’t the obvious long-term choice. So AirBnB hired a professional photographer and began going to AirBnB residences to take photos. We can see below that a few months later (December 2009), the filter “Has photos” disappeared and nice photos were already online. The team was surprised to learn that the owners of the lodgings consented to this process and tagged along with the photographer for the shoot. The result was positive in two ways. First and foremost, it allowed for AirBnB to improve their listings with the superior photos. As stated below, this program translated to more reservations and stays. Here’s the Airbnb presentation if you want to read more about the impact of the photography program. Secondly, and arguably just as important, it gave the AirBnB team an excuse to talk with the owner of the potential lodgings. This was crucial because it gave AirBnB additional insight that it could not glean from a survey or questionnaire. New ideas and concepts are revealed in unbounded conversations between individuals. AirBnB was able to learn about aspects of their process that were not immediately apparent to a developer. The picture challenge AirBnB provides a crucial insight. Far too often the focus is on doing things that scale, and scalability is good. Aspects of your business must be able to grow easily and cheaply, or your enterprise is going to have a ceiling you can’t get past. However, there are very clear benefits to doing things that do not think will scale. 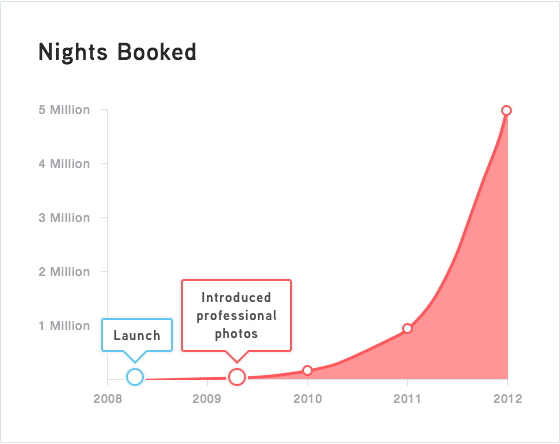 For the AirBnB team, sending out professional photographers to every location did not look like it would scale. What they were confident was that in the interim, the process of using professional photographers would help them learn important lessons and improve immediate performance. They learned what they thought was not scalable was actually worth the effort. Travellers are two and a half times more likely to book listings enhanced with better photos, earning their hosts an average of $1,025 per month. AirBnB now offers its hosts free professional photography services from more than 2,000 freelancers who have visited 13,000 listings across six continents. Do the unscalable, learn what is important, and you will be amazed at what is possible and where value can be discovered. No case study regarding AirBnB would be complete without discussing how it used Craigslist. The challenge with talking about this particular aspect is that it is not good practice to promote something that could be considered unethical or possibly leave someone open to lawsuit. It is arguable that what AirBnB was against sound business ethics. It is also possible that they violated Craigslist Terms of Service. While the issue has passed, it is important to emphasize that all entrepreneurs should embrace business ethics and avoid violating a competitors’ terms of service. At the time of its earliest development, Craigslist was the most popular website for subletting and leasing. It would have made sense for AirBnB to use Craigslist as its platform – especially while the team was trying to verify its business model. However, AirBnB deliberately chose not to for some very good reasons. The idea for a more personalised, secure experience in comparison to what Craigslist offered made complete sense in terms of what they were and how they wanted to position themselves. However, Craigslist had a massive store of both renters and people seeking accommodation. AirBnB wanted to capitalise on that. At the time Craigslist did not have an API that would allow for information to be input into their system or pulled off. So AirBnB created an application that allowed renters to post their information into the AirBnB platform and then be automatically uploaded to Craigslist. We will focus first on how AirBnB helped hosts to attract more guests and then how AirBnB recruited more hosts from Craigslist. 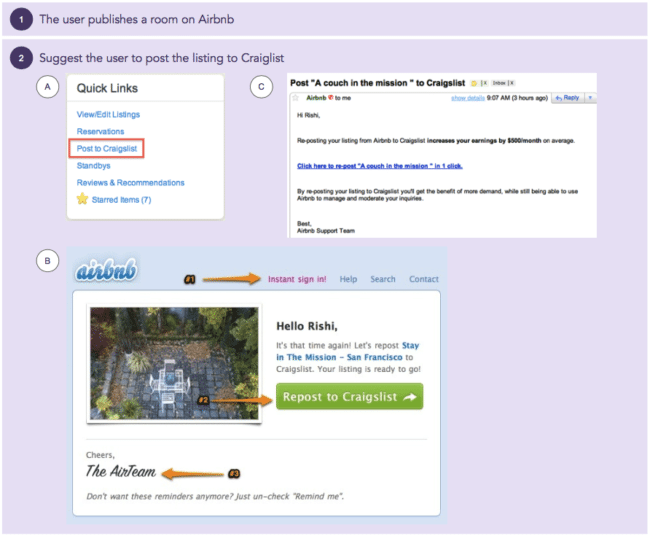 Once the user published the room on AirBnB then a quick link appears to suggest to post it on Craigslist website (Screenshot A). The Screenshot A was the first version released in 2010. As mentioned earlier, back to days, Craigslist was already very popular and used by sub-letters. Afterwards they improved it (Screenshot B and C) to foster more hosts to use it because of the success of the feature. As Rishi Shah mentioned, the improved version included a stronger call to action (#2), a sense of branding (#3) and an instant Sign in (#1) to make it even easier for users. Now let’s see the process to re-post to Craigslist. The page below is a screenshot of what hosts see when they click on “Repost to Craigslist“. #1: AirBnB needed to scrap information from Craigslist to successfully populate the 2 drop-lists (“Craigslist Category” and “Craigslist Market” shown above) with the right values. This was necessary to post the listing to Craigslist. #2: the 2 fields suggest that AirBnB was also able to send information to Craigslist to post the listing. Use the same listing published on AirBnB to re-post on Craigslist. #4: certainly hosts had questions before re-posting the listing. In general, it’s important to respond to questions users may have before they complete the action requested, and describe the value of this action if it’s not obvious. When you buy a product online, don’t you want to know when it will be delivered? the return policy? etc. any action requested to perform implies questions that users will have. It’s your job to figure out. If you analyse this under the light of AIDA (Attention, Interest, Desire and Action), this small text does a good job. If you want to know more about AIDA, then I recommend this post written by Crazy Egg. #5: this is quite interesting. This helps increase Trust because you have the feeling that if you need assistance then you can get help. 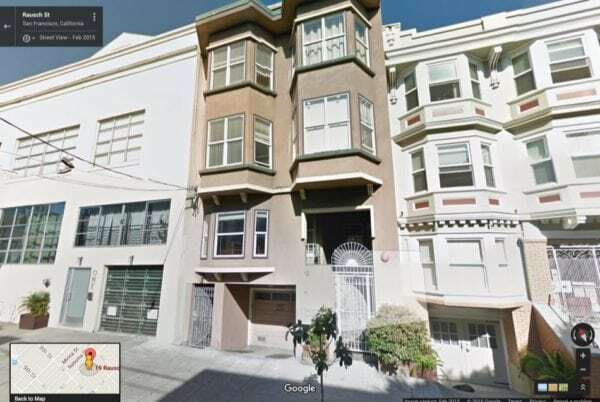 As the Craigslist ad contained all of the relevant information regarding the particular space as well as a link to the AirBnB site to book the room. This effectively gave AirBnB access to Craigslist’s customers without having to execute any transaction over Craigslist. The superior photos and properties that were specific to AirBnB were often enough to encourage repeat customers to skip Craigslist entirely and just go to AirBnB. The simplicity of the application from cross-listing properties on the two platforms was crucial. One of the common mistakes entrepreneurs make is to try to increase the adoption of a feature too soon or to optimize it before validating. 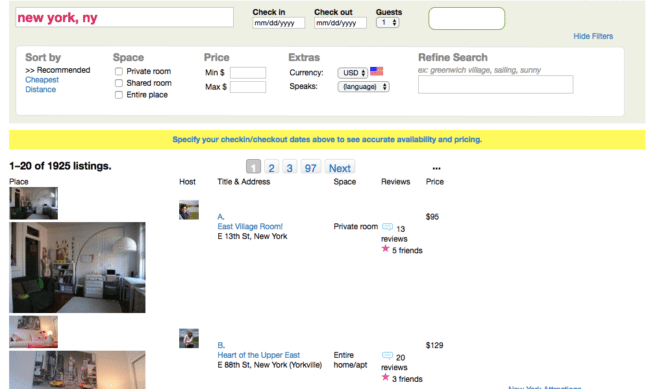 While the back-end integration with Craigslist was complex, the user interface was simple. This was enough for the AirBnB team to assess the impact of the application in term sof acquisition driven by the “repost” feature. It’s usually useful to monitor the feature adoption and the value is creating on your platform then try to optimize it later, as small and fast iterations can help design the best solution. While AirBnB would try to optimize that application’s functionality, the key features would remain the same. In addition to the acquiring renters from Craigslist, AirBnB also developed a tool that allowed them to reach out to potential property owners. AirBnB created a bot that would send routine posters on Craigslist invites to list their property on AirBnB. This allowed AirBnB to obtain additional properties that they could offer their potential customers. While inappropriate, AirBnB’s tactics were effective. While complex on the back-end, the key to AirBnB’s ability to get their customers to adopt the repost button was by making it simple for them to use. Every company has to build their brand recognition, and some businesses will have it easier than others. Bland, neutral products do not generate positive word of mouth. Bad experiences will generate a reputation, but certainly not one you would like to build your business on. The key is provide a unique experience that is novel enough to comment on, but something that is positive as well. AirBnB is a naturally novel experience, especially since the sharing economy was not as well known a phenomenon back when the company got started. People who used AirBnB for the first time was naturally going to talk about it with their friends and family because of the novelty. The only question was whether they would have good things or bad things to say. What increased the pressure on creating a great experience for every customer every time was the same thing that made AirBnB so attractive from a viral perspective. Because what AirBnB was so novel, so new, any significant bad experience could kill the business before it had a chance. A bad hotel stay every once and a while could be forgiven; after all hotel have a long track record of being positive on the balance. AirBnB had no track record, so every failure would have an oversized impact. That is why AirBnB was committed to providing the best experience possible from the beginning. AirBnB was able to build this positive reputation over time, by not trying to do too much too fast. AirBnB’s vision of quality set the direction of where the company wanted to go, but it did not define the early steps to the degree that it made the site complex and too difficult to manage. AirBnB kept their product simple and expectations low to ensure positive experiences. Then, as time went on, AirBnB iterated and added new features, such as professional photos showing off the properties, interactive maps, and Craigslist cross listing. By starting and small and iterating to better outcomes, AirBnB was able to protect its fragile new industry and gradually build a strong reputation through continuously meeting or exceeding expectations. It is a lesson that all new businesses should take to heart. The last big hurdle AirBnB had to do was built brand recognition in the market. They had the optimised platform, the properties, and the plan. Now they just needed to make it happen. Word of mouth was going to be a big part of their strategy as it played to a lot of the company’s strengths. They had a naturally “sticky” story because the experience was incredibly novel and unique in comparison to the status quo. There was also a focus on developing exceptional experiences for every customer every time. This was all discussed in the previous section, but it is important to highlight how crucial that was from a marketing perspective. AirBnB embraced that strategy from day one. 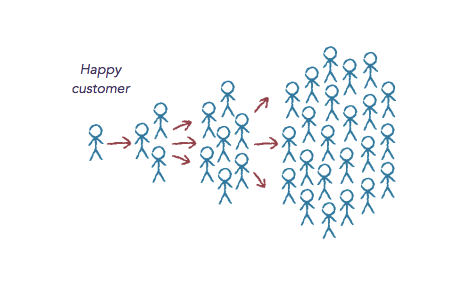 But now that they had that, they also wanted to build a referral program to enhance their strategy. They began with a referral program. 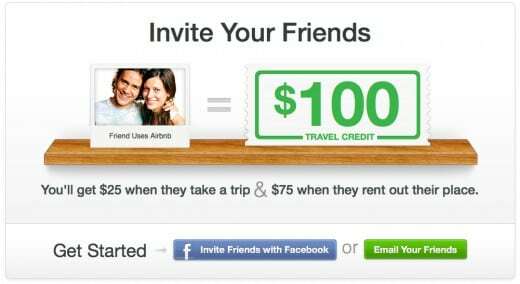 The company incentivised would-be travellers offering $25 in travel credits when a referred friend rented from Airbnb and $75 when a referred friend listed his or her property for rent on the site. When a person made a referral, they sent their friend or contact a specific referral code which allowed the referrer to secure the appropriate credits. With the infrastructure established, all that remained was optimising the referral system. 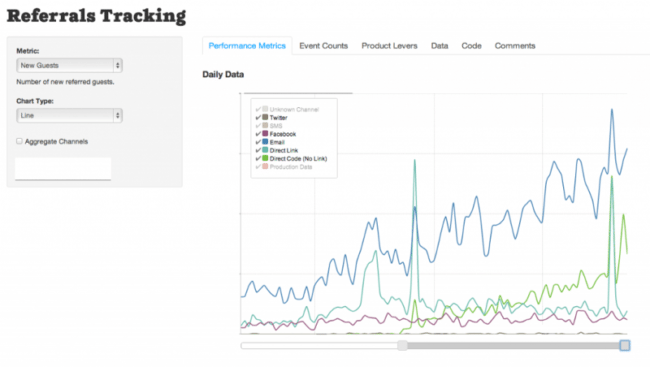 First, AirBnB evaluated the type of growth they could get based on their first experiments. AirBnB had already built dashboards to evaluate how users interacted with the referrals product, measuring its impact on day one. Increasing the number of invites per inviter by offering participants the option of importing their email and cell phone address books. Increasing the “conversion to new guest” by allowing referrers to send reminders to their invited friends. The final step was for AirBnB to determine how to increase the conversion rate for referral emails. This entailed finding the strategic moment when to send a referral email and how to increase discoverability. Further, AirBnB needed to figure out how to make the referral emails more personal. Studies have shown that 92 percent of people find personal recommendations from friends more compelling than advertising. Making referral emails more personal could only improve on those odds. It was on these points where AirBnB took advantage of A/B testing their emails. AirBnB conducted a myriad of tests, on everything from when to send the emails to how the email was phrased. For example, one test was about how to communicate the value proposition for the referral. In one email, they emphasised that the person making the referral can earn $25 for inviting a friend, appealing to their referrer’s self-interest. 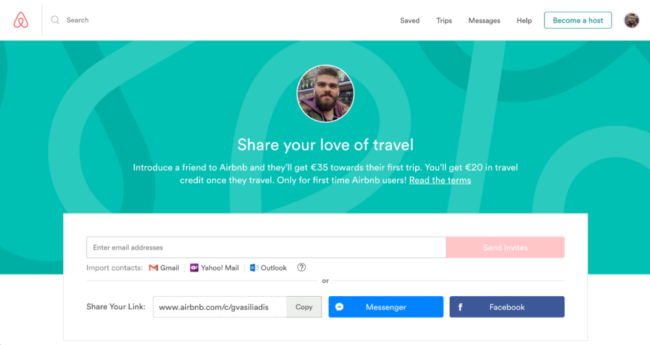 In the other email, AirBnB emphasised that that referrer could share the $25, appealing to the referrer’s altruism. 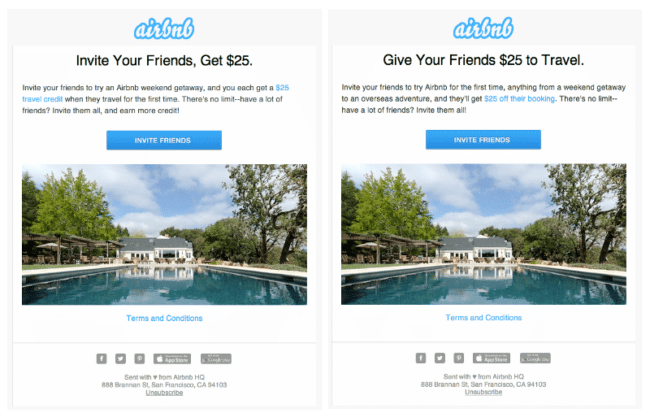 By conducting this A/B testing, AirBnB was able to increase the conversion rate of their referral emails, increasing sales. In some markets, the referrals increased bookings by over 25%. AirBnB’s experience with referrals demonstrated the importance of testing everything when it comes to optimization. You can never know what element will be crucial to your success. Those things that could be small might actually be big. When you optimize, test everything like AirBnB did, and you will find success. AirBnB is one of the dominant players in Silicon Valley, but they didn’t get there by knowing what would happen every step of the way. They were blindsided by some things, and other times they went through dry spells. They persevered and did the things that weren’t going to immediately translate to a quick fix because by doing the hard thing they learned what they needed to know so they could build something unique and valuable – something no one else had. They started with desperation. The moved forward with perspiration. And they excelled through iteration. To succeed like AirBnB as an entrepreneur, you must be prepared to embrace the same principles, or the only thing you will find is frustration.